A loin cloth-wearing gladiator with a bright red plume atop his helmet sauntered by while two children battled each other with swords. No, I had not stumbled onto a movie set; I was at one of the most recognizable historical sites in the world—the Roman Colosseum. I was four or five years of age when I first read about the ancient Romans. After several months of historical study (most of my Kindergarten year…serious stuff), I knew that I wanted to spend my life uncovering the past while surrounded by testaments to human greatness. After earning a doctoral degree in history, I treated myself by visiting Rome for the first time. I couldn’t wait to explore the places that had inspired my childhood dreams. Our taxicab driver took us on a harrowing ride through the narrow streets that led to our hotel. Shivers went up and down my spine as I glimpsed two-thousand-year-old buildings. I had arrived. I was in Rome. After having our fill of pasta and a good night’s sleep, we were ready to explore the city. First historical site on the list? The Colosseum. When I queued up to get tickets, it took a great deal of self-restraint not to rush forward into the beloved amphitheater. After a minimal wait, I entered what has been a marvel of architecture, engineering, and social stratification since 80 AD…the Colosseum. Known for its colossal size, design, and the bloodlust that went on within, the Colosseum was built for both practical and political reasons. The Romans needed a theater, but the new Flavian dynasty needed support. Previous emperors, such as Nero, had polarized the Roman people and caused them to distrust their leaders. By returning to the people space that Nero had appropriated, Flavian Emperors Vespasian and Titus hoped to regain the people’s support for the empire. Paid for with plunder from the Jewish wars the Colosseum was a symbol of Roman architectural and engineering greatness, a monument to military triumph, and a warning to groups not found in the favor of Rome’s ruling elite. To make the arena accessible and curry Roman citizen’s favor, the emperors had made admission free. Tickets, however, were mandatory. A person’s ticket showed where he was to sit and which gate he would enter—this was both practical and political. Practically, the tickets allowed for easy seating and dispersing of spectators; politically, your place in the arena indicated your social status. In the lowest tier, Roman elite were able to enjoy the action up close. The equestrian order enjoyed seats in the second tier while common folk occupied the third and fourth levels. There was further social stratification within each tier. Women were segregated into their own section of the cavea (auditorium). A huge awning screened spectators from the sun. As I wandered around the amphitheater…a little lost (not many placards)…I envied those people with personal guides and contemplated how the Colosseum was still stratified to a degree. Those with private tours were able to visit areas restricted to the rest of us. They received in depth information about the place’s history. Just like the Romans who had occupied the arena in the early 1st century AD, we were also marked by our style of dress. Clothing indicated our economic class and, perhaps, our nationality. The Colosseum is a wonder to behold. Its sheer size is almost overwhelming. Activity is constant as people teem about and children imitate gladiatorial battles. History envelopes you and allows for mind travel back in time. I stood at the end of the elliptical arena—halfway covered with a wooden stage—and for one glorious minute the stadium seemed to go silent. I imagined wild beasts stalking their prey. I looked down into the passages beneath the stage and imagined how gladiators must have felt as they waited in their cells. Imprisoned beneath the theater, they would exercise and practice hoping to live through another show. I thought about how the crowd’s bloodlust would grow the longer the show went without a death. Although throngs of tourists had entered the gates since we had first arrived, their sound probably didn’t compare to the cacophony of noise that 50,000+ spectators would have made when the stadium was full. Wandering around the vast interior, the lack of signage allowed me to roam around in historical contemplation. I enjoyed seeing children light up as they came through an arch and could see the arena in its entirety. Who am I kidding? I probably beamed as brightly as any child. I practically hopped with excitement through the magnificent monument. I even delighted in visiting the public restrooms. Washing my hands, I looked down to see pebbles from an ancient wall strewn along the floor. I found them utterly charming. As I left, I swore to the Colosseum that I would be back. Outside a gladiator offered to take a picture with me…for a pretty penny…I passed. As I gazed upon the exterior arches contemplating what had once filled their niches, a man with a Texan twang told his wife that the Colosseum took up valuable real estate space. I looked at him aghast horrified at the thought of losing this piece of cultural importance. The Colosseum is big and showy. It looms large and swallows you up once inside. One feels both dwarfed by its size and gigantic with pride for human intellect. Its architecture is a testament to human greatness; its interior was witness to the darker side of human nature. At its heart the Colosseum is, and was, a showpiece. It’s meant to impress. It isn’t trying to be anything other than what it is—a colossus. People can take as much or as little historical knowledge from it as they wish. The Colosseum is part of our world’s heritage. Thankfully, the Romans are gracious enough to let us take from it. Tip: The Roma Pass allows entry to two museums/archaeological sites plus free use of the city’s public transportation system. The metro stop for the Colosseum is Colosseo. Note that it’s frequently spelled Roman Coliseum, too. The Colosseum, Roman Forum, and Palatine Hill are all considered one site so you get a lot more bang for your buck. Also, pass holders get to use a special line and bypass the ticket line (a major bonus as the ticket line can be quite lengthy). Roma Passes are available for purchase at several tourist information places around the city including the sites themselves. Be wary of those selling fake Coliseum tickets in Rome. I would recommend going to the Palatine Hill entrance to purchase if you don’t purchase at a tourist location, as the lines there are generally shorter. Palatine Hill is across from the Colosseum–not far away. You will still have to wait in the security line even with a pass, so go early to avoid colossal lines. 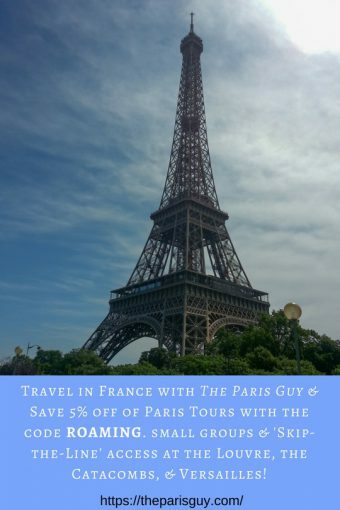 Psst…Roaming Historian readers can save money on Roman Guy tours! 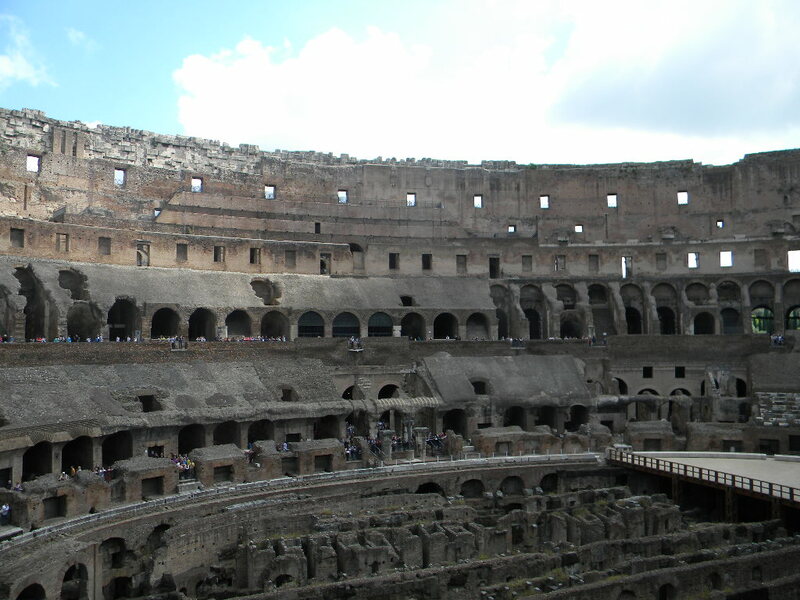 And they have great tours of the Colosseum! 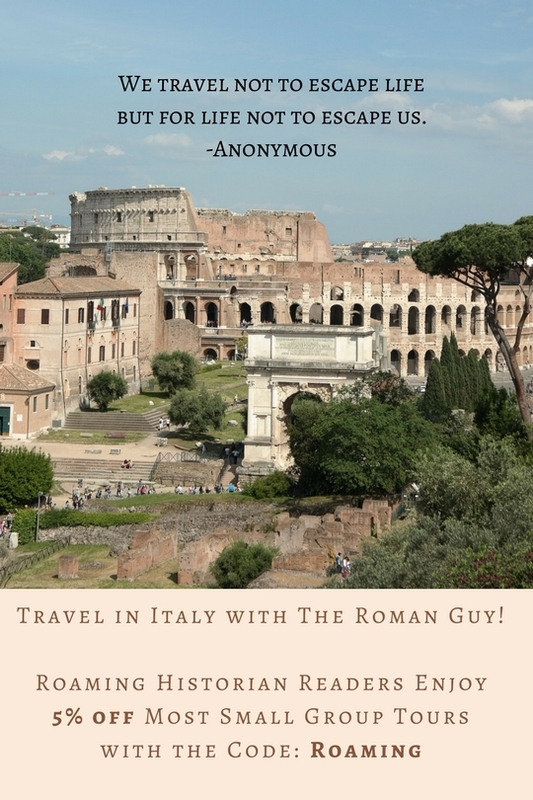 Just use the Roman Guy promo code “ROAMING” when booking to get 5% off of most small-group tours. Buon viaggio! It is a wonderful city. I’m going back in a few months; I hope you get to visit Rome soon. Great piece. I would love to re-visit my time in Rome! Fabulous job with this post! Thank you, Natasha, for such a beautiful compliment! I hope that you see Rome soon. It sounds like you really enjoyed your visit because you love history. You have selected a good niche then as the Roaming Historian! Thanks! 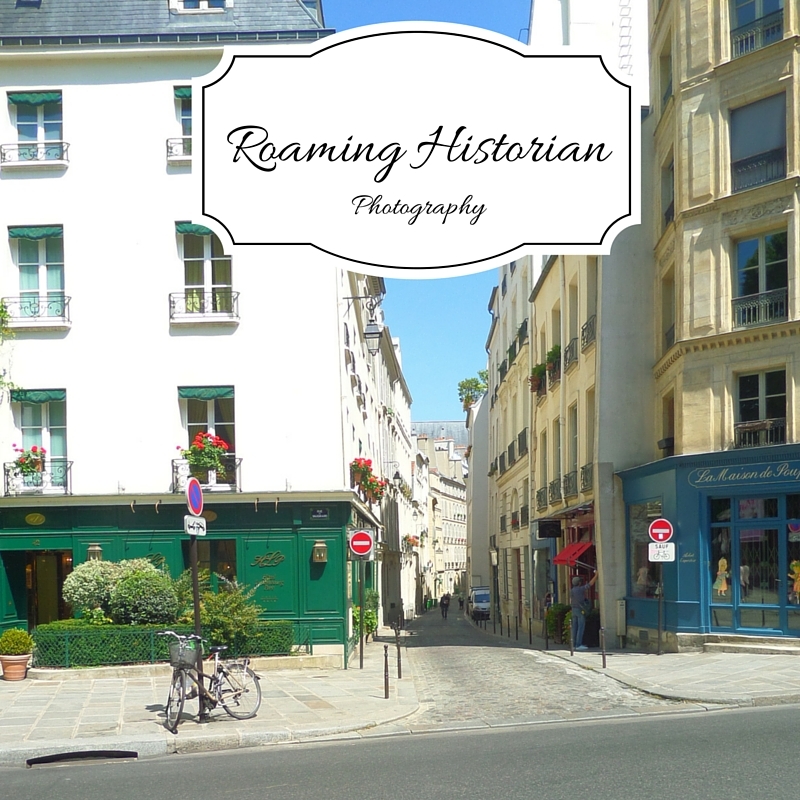 I definitely am fulfilling my dreams of seeing all the great historical sites, and hopefully encouraging others to visit them too. It must be completely overwhelming in person since even pictures look intimidating. This “must see” wonder is still on my to-do list, but at least I could read about it here. Thanks! It is overwhelming, but so breathtaking. It’s a must-see. I hope you see it someday! Greta place to visit. It is certainly a must! !